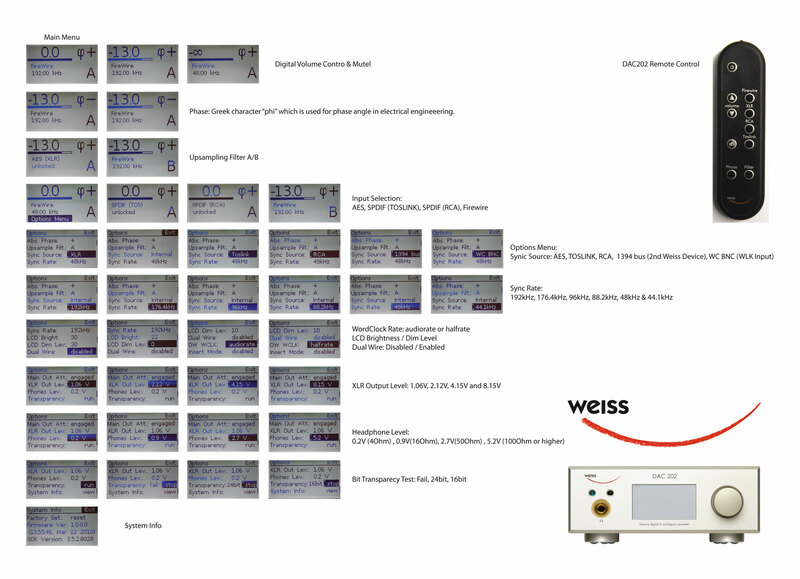 The Weiss DAC202 is the best measuring D/A processor I have measured in my quarter-century career at Stereophile. It just doesn’t get any better than this! The DAC202 is a reference quality stereo Firewire and USB (optional) D/A Converter with infrared remote control. It supports all standard sampling frequencies including DSD64 (USB Version). A high quality headphone amplifier is built in. The output levels can be set in coarse steps in the analog domain and in addition in the digital domain with fine resolution. Thus the DAC202 acts as a pre-amplifier as well and can directly drive a power amplifier. DAC202 has won more than a dozen “Product of The Year” Awards worldwide. An internal high precision / low jitter clock generator is responsible for clocking the audio section. The sampling frequency of that generator is switched automatically according to the sampling frequency of the track played. In addition there are word-clock input and output on BNC connectors for external synchronization purposes. All standard sampling frequencies up to 192 kHz are supported. The main analog output is available on two stereo pairs of connectors, one on XLR one on RCA. The headphone output is available on a 1/4″ Jack socket.